"Elope" redirects here. For the company, see elope, Inc. This article is about the act of elopement. For other uses, see Elopement (disambiguation). 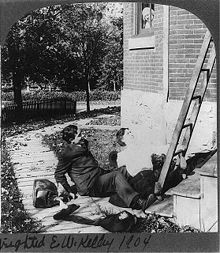 A humorous, staged photograph (circa 1904) depicting an attempted elopement with clichéd ladder to the prospective bride's upstairs bedroom. The bride has fallen down the ladder, knocking over her beau and waking her father. Today the term "elopement" is colloquially used for any marriage performed in haste, with a limited public engagement period or without a public engagement period. Some couples elope because they wish to avoid objections from parents, or religious obligations. In addition, the term elopement is used in psychiatric hospitals to refer to a patient leaving the psychiatric unit without authorization. In England, a legal prerequisite of religious marriage is the "reading of the banns"—for the three Sundays prior to the intended date of the ceremony, the names of every couple intending marriage has to be read aloud by the priest(s) of their parish(es) of residence, or the posting of a 'Notice of Intent to Marry' in the registry office for civil ceremonies. The intention of this is to prevent bigamy or other unlawful marriages by giving fair warning to anybody who might have a legal right to object. In practice, however, it also gives warning to the couples' parents, who sometimes objected on purely personal grounds. To work around this law, it is necessary to get a special licence from the Archbishop of Canterbury—or to flee somewhere the law did not apply, across the border to Gretna Green, Scotland, for instance. For civil marriages notices must be posted for 28 clear days, at the appropriate register office. In the Philippines, elopement is called "tanan". Tanan is a long-standing practice in Filipino culture when a woman leaves her home without her parents' permission to live a life with her partner. Usually she will elope during the nighttime hours and is awaited by her lover nearby, who then takes her away to a location not of her origin. The next morning, the distraught parents are clueless to the whereabouts of their daughter. Tanan often occurs as a result of an impending arranged marriage or in defiance to parents' dislike of a preferred suitor. In Indonesia, an elopement is considered as "kawin lari" or in literal translation, marriage on a run ("kawin", means marriage (slang), "lari" means running). This happens if the groom or the bride didn't get the permission to get married with each other. As Indonesia is a religiously strict country, a couple couldn't get married without parent's (or next closest living relative) consent, hence, it is rarely practiced. Thus, most Indonesian couples who engage in elopement often end up marrying without their marriage recognized/registered by the government. In Assyrian society, elopement ("Jelawta" or "Jenawta") against parental request is very disreputable, and is rarely practised. In the 19th and early 20th century, Assyrians had heavily guarded their females from abduction and also consensual elopement, when it came to their neighbours such as Kurds, Azeris and Turks, who would abduct Assyrian women and marry them, in some cases forcefully, where they would convert them to Islam. Look up elope or elopement in Wiktionary, the free dictionary. ^ Merriam-Webster Online Dictionary, elope. ^ Hannibal Travis (20 July 2017). The Assyrian Genocide: Cultural and Political Legacies. Taylor & Francis. pp. 165–. ISBN 978-1-351-98025-8.